The sign that clearly reads "Graham Read & Co., Real Estate Agents" is a good clue to the age of this photo. We know that P. B. Graham and Joseph L. Read started the Middletown Independent newspaper in 1886, so it seems logical that this photo predates that since it does not mention the newspaper. From the plat map of Middletown businesses in 1890 it appears that the Graham-Read office was the second building from the intersection of Young and Calistoga streets, so this view would be looking south to the corner of Main St. The plat map shows the building on the corner as a saloon in 1890, the building or buildings on the other side of the general store as a cobbler and a harness shop, and beyond the vacant lot a blacksmith and wagon shop. 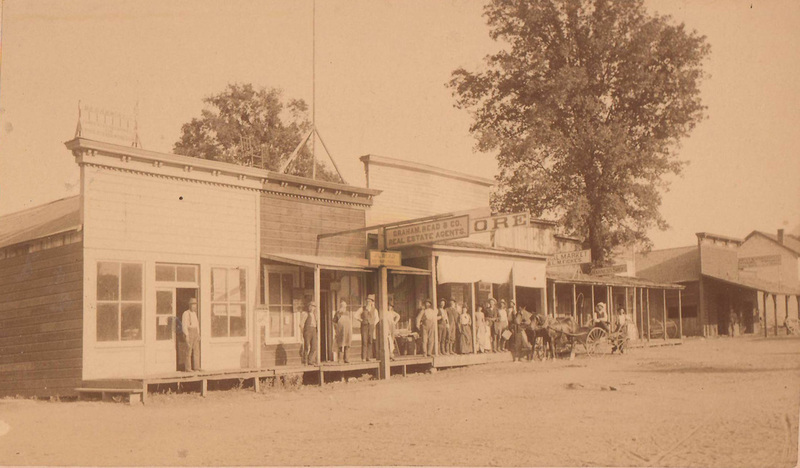 If our appraisal is correct, the peak-roofed building at the far right would be the general store that eventually was replaced by the brick building that now houses the Boar's Breath but was for decades a general store.